Are current home prices going to continue their recent upward trend, have they peaked or are prices in decline? Our readers are starting to lean toward a peaked home-price situation compared to their general beliefs one year ago. 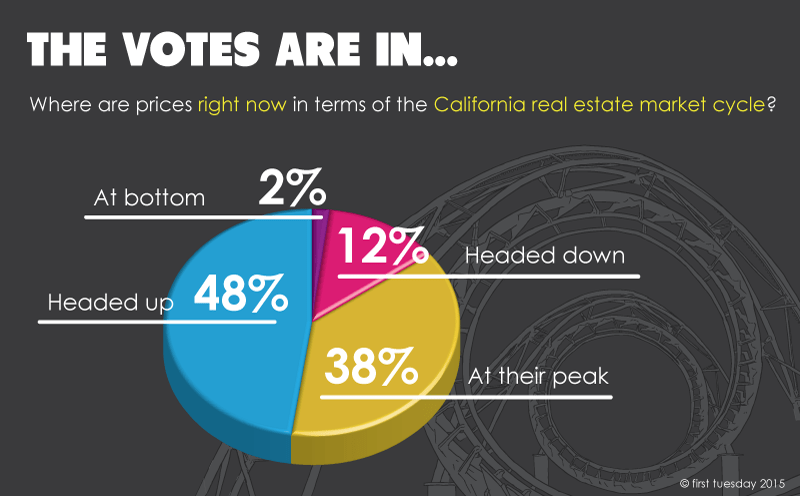 In a recent first tuesday poll, we asked where current real estate prices are headed. A solid 48% of readers believe prices are on their way up (a belief down from 55% one year ago). But in a shift from last year’s poll, 38% say prices have already reached their peak (one year ago 26% thought prices had peaked). Only 12% today think prices are going to drop (this was 18% last year). In total, half of our readers believe prices are more likely to rise, while the other half does not expect prices to increase at all. A 50:50 split, signaling a shift as voters begin to see the price bounce from two years ago finally approach its end. Unsurprisingly, predictions have altered course over the past year as prices have continued to climb but at a decelerated pace — perhaps prompting more readers to suspect the recent upward price trend is nearly over. In 2014, 56% of voters correctly predicted the continued price inflation. These poll responses closely mirrored the actual trend as home prices did increase over the past year. However, today, readers are much less confident that home prices will continue their current inflationary path, now expecting prices to stagnate in the near future, or drop. A look at recent market trends — not polls about expectations, which are typically rooted in the voter’s recent past experiences — provides some insight into where prices are heading. As predicted by most of our readers last year, California’s housing market has seen a steady increase in home prices over the past year — a trend that began at the end of 2012 going into 2013. As of August 2015, the statewide average for low-tier property prices was 10% higher than one year earlier. Average mid-tier prices were 8% higher and high-tier prices were 7% higher. Importantly, to forecast future trends in real estate pricing, properties need to be compared to properties within the same pricing tier — i.e. low-tier with low-tier. Though all real estate market prices tend to move in the same direction over time, the percentage of movement does vary greatly from tier to tier, the low tier being the most volatile by far as the territory of low down payment bets and most speculator interference. Nonetheless, tiered pricing data evidences a consistent rise in California’s home pricing across all tiers — especially low-tier property — that is likely to continue for most of 2016, until the fixed rate mortgage (FRM) rates increase. The pricing trend looking ahead is best understood as the result of price persistence. This condition, also called the sticky price phenomenon, is the tendency of sellers to resist reductions in their listed prices. Thus, you will witness several months where prices remain high while the demand to buy resale homes has dropped. Without demand from someone, end user or speculator, the sales volume declines. This is something that will not take hold until we are several months into 2016. Additionally, the lowering of mortgage rates since mid-2013 has increased buyer purchasing power (BPP). This, in turn, has driven up home prices. As BPP rises, prices follow — a trend that has occurred at the same time California’s momentous job growth has taken place, allowing more of the population to qualify for mortgages. Are California home prices doomed to plummet, as many of our readers predict? The reasonable answer is yes. However, prices are not likely to drop as soon as some may believe. In fact, the current market climate is likely to keep prices propped up until closings start to taper off quickly in mid-2016. Why? The fate of home pricing is currently in the hands of the Federal Reserve (the Fed), which plans to raise the short-term interest rate — a benchmark for adjustable rate mortgage (ARM) rates — in December 2015. First, the Fed’s interest rate hike will cause ARM rates to adjust upward almost immediately. Initially, this move will put an end to buyers using ARMs to overreach by purchasing more home than they are able to qualify to buy with an FRM. Second, the global long-term bond market will make its showing. A few months after the ARM rate moves, the FRM rates will rise, driven by rate increases in the long-term bond market. All these upward rate moves will ripple through the housing market slowly over 2016 and manifest in lower prices in 2017. To follow all this, expect home sales volume to dip going into 2017, about six months after the FRM rate hike. Only after sales volume begins its decline will home prices follow — about 9-12 months after home sales volume starts its slowdown, the sticky price delay. Thus, expect home prices to ride the current wave throughout 2016, not beginning their descent until mid- to late-2017. In the meantime, keep a close watch on Fed activity, FRM rate movement and home sales volume as your warning the market is turning off the lights and home prices will soon fall dark.